Record Number Of Volcano Eruptions In 2013 — Is Catastrophic Global Cooling Dead Ahead? Have you noticed that this December is unusually cold so far? Could the fact that we have had a record number of volcanoes erupt in 2013 be responsible? Certainly an unusually calm solar cycle is playing a significant role in producing all of this cold weather, but as you will see below the truth is that throughout human history volcanic eruptions have produced some of the coldest winters ever recorded. In fact, there have been some major eruptions that have actually substantially reduced global temperatures for two to three years. So should we be alarmed that the number of volcano eruptions this year was the highest ever recorded? Could it be possible that we are heading for a period of global cooling as a result? And if the planet does cool significantly, could that lead to widespread crop failures and mass famine? Don’t think that it can’t happen. In fact, it has happened before and it is only a matter of time until it happens again. This year will go down on record, as seeing the most volcanic eruptions recorded in modern history. The previous number was set in 2010, at 82 volcanic eruptions for the year. The number of volcanoes erupting across the planet has been steadily rising from a meager number of just 55 recorded in 1990. While most scientists may readily dismiss any significance to the latest figures and may be quick to say the planet is just experiencing normal geological activity, it does raise other concerns about just what may be transpiring within the interior of our planet. The average number of volcanic eruptions per year should be about 50 to 60; as of December 5, 2013, we already at 83. Volcanic eruptions are one way the planet dissipates a dangerous build-up of heat, magma, and pressurized gases. The planet’s outer core is thought to flirt with critical temperatures in the range of around 4400 °C (8000 °F). Any rise or major fluctuation in interior gradient could have profound and disruptive effects on processes whose very properties are government by convective heat emanating from the planet’s outer core: magnetic field propagation, tectonic plate movements, sea-floor spreading mechanics, and mantle plume activity. Mantle plumes or hotspots are thought to be the central mechanism which fuels the vast underground chambers of many of the world’s supervolcanoes. And what is going to happen if the number of volcanic eruptions continues to increase? If volcanic activity continues to increase, and there is an eruption big enough to send millions of tons of ash and dust into the upper layers of the atmosphere, then the Earth’s temperature would likely drop at least a degree or two from present levels. This happened in June of 1991 when Mount Pinatubo exploded in the Philippines. For the following year, the Earth’s temperature dropped about 1-2 degrees before recovering several years later. Most recently, the 1991 explosion of Mount Pinatubo, a stratovolcano in the Philippines, cooled global temperatures for about 2—3 years. This is by far the greatest “climate change” threat that we are facing. Something appears to be happening to the crust of the earth, and if the number of volcano eruptions continues to rise, we could be in store for absolutely catastrophic changes to our climate. 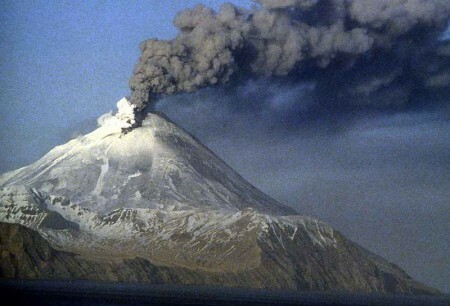 Shiveluch on the Kamchatka Peninsula: The Shiveluch Volcano erupting in Kamchatka has spewed ash nine kilometers high, the Kamchatkan territorial emergency situations department reported on Tuesday. Twin Volcanoes in Vanuatu: Steam and ash stream from the twin volcanoes on the island of Ambrym in the Pacific archipelago of Vanuatu, as seen in a picture captured from the International Space Station as it passed overhead. “Not every day you get to see an active volcano, let alone two,” NASA astronaut Mike Hopkins tweeted on Monday. Mt. Etna in Sicily, Italy: The New SE crater remains restless. As the following time-lapse video of the past 24 hours shows, there is occasional weak lava extrusion from effusive vents on the upper flanks, and rarely glow from the summit vent suggesting that the magma column is relatively still high inside the vent and sometimes produces deep-seated strombolian explosions. So should we be concerned that there has been a record number of volcano eruptions this year? Is catastrophic global cooling dead ahead? Or could it be possible that this is just an anomaly and that things will return to normal next year?